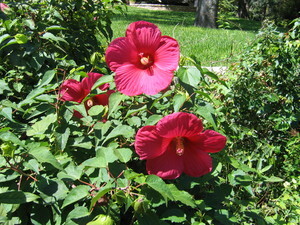 What does a famous boulevard in Berlin have in common with beds of showy hibiscus right here in north central Texas? The boulevard Unter den Linden is lined with linden trees that are, like hibiscus, members of the Malvaceae family. This family contains over 4,225 species of herbs, shrubs and trees. Let’s take a look at six members of Malvaceae that lend ornamental value to the Texas garden. This semi-woody shrub grows 3 feet tall and 3 feet wide in USDA hardiness zones 8a and south. 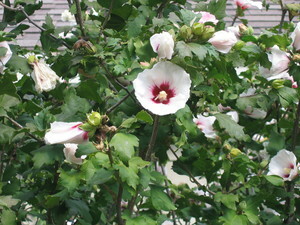 It assumes a bushy, upright growth habit and produces an abundance of small, white, hibiscus-like flowers with maroon centers May through October that attract bees, butterflies and hummingbirds. The blooms last only one day, however. Brazilian rock rose prefers full to part sun, resists deer, tolerates drought and therefore makes an excellent plant for a xeriscape. Use it in beds, a rock garden or in containers. Since it reseeds easily, you’ll have seedlings to manage. You can move these seedlings to other parts of the yard, give to plant-loving friends or treat as weeds and dig them up. Prune the mature plant, if desired, to keep compact. Several species and cultivars of hardy hibiscus do well in Texas, including the native Hibiscus coccineus ‘Texas Star,’ which has deeply-lobed leaves and showy red flowers. Three hardy hibiscus have made the Texas Superstar list, and these are ‘Flare,’ ‘Lord Baltimore’ and ‘Moy Grande.’ ‘Flare’ sports 10-inch-wide, showy, fuchsia-red flowers that bloom summer till frost. The flowers are sterile, which means the plant is almost constantly in bloom because it directs all its energy to flower production and not seed production. ‘Flare’ demonstrates hardiness to zone 5, requires full sun, tolerates alkaline soil and grows 4 feet tall by 4 feet wide. ‘Lord Baltimore’ is also cold hardy to zone 5 and is an improved sterile hybrid with distinctively deeply-lobed leaves. It produces stunning red flowers up to ten inches wide summer till frost, grows 5 feet tall by 5 feet wide, prefers neutral to acid soil and requires full sun. ‘Moy Grande’ was released from the late Dr. Ying Doon Moy, plant researcher at the San Antonio Botanic Garden, and is the largest open-face hibiscus flower in the world with 12-inch-wide, rose-pink blooms. ‘Moy Grande’ will grow in acid or alkaline soils. Nothing adds more cottage-garden-like charm to a house than old-fashioned, single-flowering hollyhocks. These old garden favorites produce huge (4 to 5 inches diameter), outward-facing, single flowers in a wide variety of colors including reds, pinks, whites and light yellows on tall, rigid spikes that reach 5 to 8 feet tall and bloom spring through summer in full sun in all parts of Texas. The flowers attract hummingbirds and butterflies. Although considered a biennial or short-lived perennial, plant them from seedlings in the spring and watch them shoot up and produce spikes of showy flowers their first season. Since hollyhocks self-seed, you’ll have seedlings coming up the first and even subsequent season. The foliage is susceptible to a number of diseases, but the flowers are generally not affected. This native of India and China was introduced into cultivation about 1600 and makes a vigorous, upright, vase-shaped, multi-stemmed, deciduous shrub that grows 8 to 12 feet tall and 6 to 10 feet wide in USDA hardiness zones 5 to 8 in full to part sun. It can grow as a large shrub or be trained as a small tree or espalier. Showy, hollyhock-like flowers up to 3 inches in diameter bloom June to October. Depending on the cultivar, flowers can be single or double, white, pink or bluish-lavender. Plant this shrub in groups, as a specimen or use as a hedge or screen. It looks great in mixed borders with other shrubs, roses and perennials. This Texas native forms a small shrub that is woody at the base and herbaceous on top and grows to a height of 3 to 4 feet and as wide. Cold hardy as far north as USDA hardiness zone 8, it requires neutral to alkaline soils, grows in full to part sun, tolerates heat and drought and demonstrates a long blooming period. The satiny-pink, hibiscus-like flowers add color to any landscape, attract butterflies and hummingbirds and bloom April through November. Another Texas native, Turk’s cap is an herbaceuous perennial that, in north central Texas, will die to the ground after a killing frost in the fall and return the following spring to form a shrubby plant 2 to 4 feet tall (sometimes taller) and about 2 to 3 feet wide. In full sun, its leaves droop, but in shade, they are held more horizontally and make the plant look perkier. 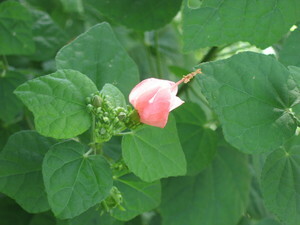 Turk’s cap gets its common name from its unique flower, which is a whorl of bright red petals that never fully open and resemble a fez, a type of headgear worn by Turks in generations past. The cultivar ‘Big Momma’ has red flowers about a third larger than the species’ flowers. A pink-flowering cultivar named ‘Pam Puryear’ also exists as well as a less common white-flowering selection. Turk’s cap blooms from late spring until frost, and the flowers attract hummingbirds and butterflies. After the flowers disappear, marble-sized red fruits develop and appeal to the appetites of many different birds and animals. These fruits drop to the ground and will germinate, thus providing you with additional plants that you can transplant or give away. You don’t have to visit Berlin to see members of the Malvaceae family because you can grow six members of that family right here in your north central Texas garden. Plant them, and you’ll marvel at these marvelous members of Malvaceae! Steve Huddleston is the senior horticulturist at the Fort Worth Botanic Garden and co-author of Easy Gardens for North Central Texas.